Furnishing any office with round reception desks is an inviting way to greet visitors. So, if you’re looking for a well-made, round reception desk to welcome your guests, but don’t want to break the bank, turn to Reimagine Office Furnishings (ROF). Since 1991, ROF has specialized in new, used, and refurbished/ remanufactured office furniture. We offer reception desks from some of the top manufacturers in the industry, such as HON, Steelcase, Herman Miller, and Indiana Furniture, so you can be sure that the reception desks you buy from us will be able to withstand heavy daily use while looking great for years to come. Plus, when you purchase reception desks from ROF, you can expect it to arrive promptly because our close proximity to a major port and international airport allows us to easily and expeditiously ship our products all over the country. 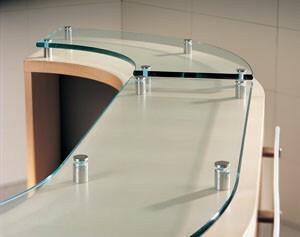 For more information on round reception desks from Reimagine Office Furnishings, contact us today. We will gladly answer any questions you may have. Description: Comfortable organic shapes, Bench with available back, Integrated duplex and USB port, Coordinating table with sharing ports. Description: Leather Lounge Seating available in Chair, Love Seat and Sofa in Black.